Pete Buttigieg has officially launched his bid to become the Democratic Party nominee for the 2020 presidential election and challenge Donald Trump for the White House. He held his launch event in South Bend, the Indiana town where he has served as mayor since 2012. Setting out his vision to “re-imagine our future”, he promised a “totally different” politics from Mr Trump. Should he win, Mr Buttigieg would be the first openly gay US president. At 37, he is the youngest entrant in a crowded field of Democratic candidates that features Vermont Senator Bernie Sanders, 77, and 76-year-old Massachusetts Senator Elizabeth Warren. Despite his relative inexperience, the former Rhodes Scholar has surged in the polls in recent weeks, propelling him from the margins to the front of the pack. In a veiled attack on the Trump administration, he railed against the “myth being sold” be those who sought to “stop the clock and turn it back”. “It is time to walk away from the politics of the past and toward something totally different,” he told supporters at his launch event. His campaign has so far focused on gun control, climate change and LGBT rights and other progressive issues he hopes will appeal to millennial voters. Mr Buttigieg’s track record as mayor of South Bend, which has seen a struggling economy improve during his tenure, has also earned him plaudits. Since announcing his presidential run in January, Mr Buttigieg has garnered a wave of attention from the media and voters, raising more than $7m (£5.3m) in funds in the first quarter of 2019. Analysts believe he could appeal to both moderates and progressives in the Democratic Party. However, opinion polls in Iowa and New Hampshire last week put Mr Buttigieg third in both states, behind Bernie Sanders and former Vice-President Joe Biden. 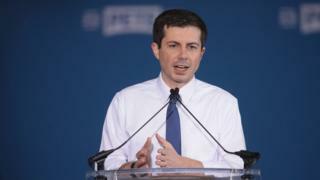 At the rally, Mr Buttigieg sought to differentiate himself from rivals as a candidate taking the “long view”, especially on issues such as climate change. “I recognise the audacity of doing this as a Midwestern millennial mayor,” he said. More than a dozen rivals are running to be the Democratic Party candidate for the presidential election in November 2020. The process of selecting a nominee will begin early next year.